Doug Baldwin sprained his MCL in the opposite knee that was giving him trouble throughout the preseason. He did not return after exiting in the second quarter. DENVER — Seahawks receiver Doug Baldwin had already said he would have to manage a sore left knee throughout the 2018 season, an ailment that caused him to sit out all of the preseason. Now comes a potentially even bigger issue with his right knee as Baldwin suffered what coach Pete Carroll called a sprained MCL in the first quarter. 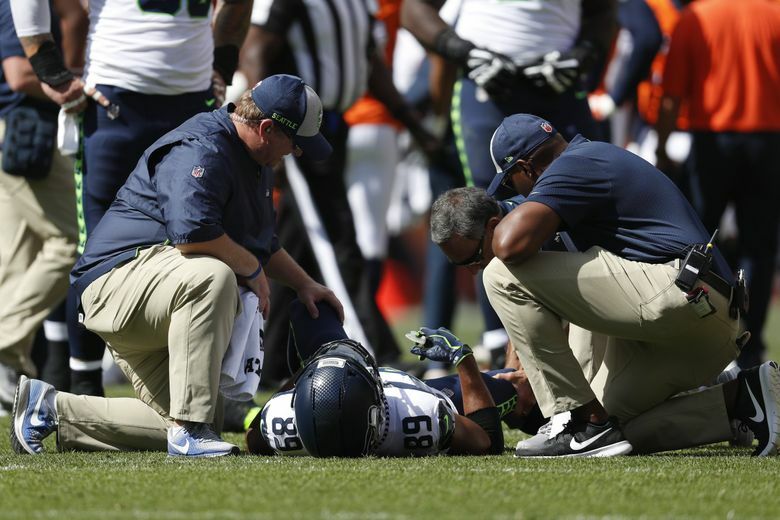 Baldwin was injured with 5:29 left the Seahawks’ defeat to Denver on Sunday, and came off the field. He later returned and played throughout the second quarter before the team decided at halftime to shut him down. Carroll said it was too soon yet to know how long Baldwin — who was targeted just once and did not make a catch — may be out. “We’ve just got to see what that means,” Carroll said. “He went back in the game and played some but we just eventually talked him out of playing because he wanted to keep going. Just making sure we were taking care of him. Baldwin hadn’t been held without a reception in a regular season game since the last game of the 2013 season — a span of 64 games. Baldwin hasn’t missed a game since the 2012 season and his streak of 89-straight starts is the fourth-longest active streak in the NFL. Baldwin’s departure left the Seahawks with just four active receivers for the rest of the game — Tyler Lockett, Brandon Marshall, Jaron Brown and David Moore. Seattle has two receivers on its practice squad in Caleb Wilson and Keenan Reynolds and might have to make a move this week to add depth before next Monday night’s game at Chicago. Seattle also is reportedly going to sign Malik Turner — who was with the team throughout the preseason — to the practice squad this week. Lockett said Baldwin’s absence was noticeable.